Do you recall the most famous One of all, Jesus the Son of the living God! From the manger, to the Cross, to the Ressurection, to being seated at the right hand of God, and soon to return to recieve His Beloved Bride! This is Jesus, the Begining and the End, the First and the Last. The King of all kings and the Lord of all lords. He is mighty in power, He is the all Glorious One. He is the Ancient of days. He is Jesus, the Son of the living God. The One who sits on the throne. He is the Christ in Christmas! No matter how the world tries to take Jesus from Christmas, they will never prevail! He is the Christ in Christmas, who was and is and is to come! He is the reason for the season and they cannot take the reason away , no matter how they try to reason. Christ has already prevailed! He has won the battle. Declaring "Happy Holidays," does not change the fact that Jesus Christ holds the keys to the Kingdom. Satan has already lost this battle at the Cross of Calvary, and even before the Cross, when God kicked him out of heaven, and made a spectacle of him!!! Our God reigns forevermore! Glory in the highest!!! Jesus is no longer in a manger, but we praise God that He sent His only begotten Son to a lost and dying world, so that we would have a Savior. We say thank you to our wonderful heavenly Father for His precious gift, that He has given to us. Those who unwrap Jesus, and embrace Him as their Lord and Savior will never die, because death has lost it's power over us! Though we die, we shall live again in eternity with our God!!! So even though the world tries to remove Christ from Christmas, it is utterly impossible. We who are alive in Christ Jesus wear Him as our Banner most proudly! We know He truly lives, and we celebrate the Christ of Christmas. We can only pray this Christmas season, for you who do not yet know and love Him as Savior, that you to will declare Him as Lord. You will be blessed beyond measure. Jesus Christ loves you. He paid the price for your sin, He gave freely. May you Put the Christ whom Christians adore in your Christmas season, and wear Him as your Banner! Yes, Jesus was born in a manger, and died on a Cross, and rose on the third day, but now He is sitting on the throne at the right hand of God. Make this Jesus your blessed Savior, and truly live, and declare what Christmas is all about. It's the celebration of Christ the Lord! There is no other God besides Him. He is Jesus! God's only Begotten Son, the reason for the season. Rejoice and Celebrate! Luke 1:30-33Then the angel said to her, "Do not be afraid, Mary, for you have found favor with God. And behold, you will conceive in your womb and bring forth a Son, and shall call His name JESUS. He will be great, and will be called the Son of the Highest; and the Lord God will give Him the throne of His father David. And He will reign over the house of Jacob forever, and of His kingdom there will be no end." Luke 2:7-14 And she brought forth her first born Son, and wrapped Him in swaddling cloths, and laid Him in a manger, because there was no room for Him in the inn. Now there were in the same country, shepherds living out in the fields, keeping watch over their flock by night. And behold, an angel of the Lord stood before them, and they were greatly afraid. Then the angel said to them, "Do not be afraid, for behold, I bring you good tidings of great joy which will be to all people. For there is born to you this day in the city of David a Savior who is Christ the Lord. 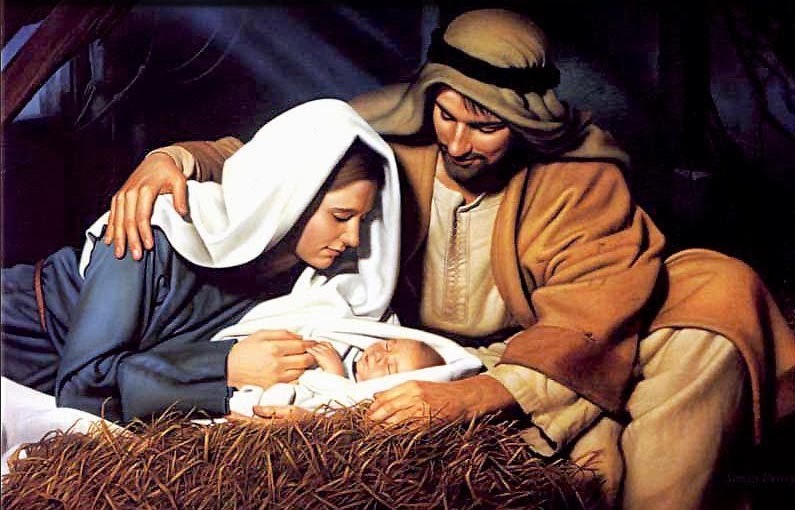 And this will be the sign to you: You will find a babe wrapped in swaddling cloths, lying in a manger." And suddenly there was with the angel a multitude of heavenly host praising God and saying: "Glory to God in the highest, and on earth peace, good will toward men!" Amen Glory to God in the highest! And God would say to you, fear not, for Jesus is the Christ, would you please except His gift that He is offering to you? Do not fear what others will think of you, but, fear the Lord, and receive what God is offering to you. Salvation in exchange for all of your sins. There is no greater love than the love of God. He is longing to save you from your sins, all you must do is acknowledge and receive, and you too will be accepted as His beloved child, and have a reason to celebrate the true meaning of Christmas!